Dongguan Zhongya Garment Co., Ltd.
about us guangzhou diqi clothes co.,ltd. accept custom made size or plus size. Service: 1) Receive urgent order 2) Eve ry garment can be made accurate by your demands, changes to your design . Main products: Blouse, tunic, jacket, blazer, vest, coat, dress, skirt, pants, shorts, cut and sew etc . Main fabrics: Cotton, viscose, silk, linen, wool, polyester and other blended fabrics. 4: What is your MOQ (minimum order quantity)9 Our minimum order quantity is 200pcs for each design. 5: What about your Payment Terms9 We accept payment Western Union or Bank Transfer. 7: What about your delivery time9 Can we receive our goods on time9 Usually 10 to 30 days after order confirmed. Dongguan Manni Dress Co., Ltd.
this oversized jersey top has been crafted from a linen-mix jersey. the top has been cut with an oversized fit. omiting middle process,selling to wholesaler and retailer.competitive price and high cost ratio. various styles,latest designs,can mix order any design,size,colors. Changshu Wintop Import & Export Co., Ltd. This top can be styled out in many different ways. Everyday casual, loose-fitting tunic has a wide cowl neck, long sleeves, and spilt back. The neck is a loose cowl shape and the split back allowing your arms to move rather easily. ISLAND SHOP INTERNATIONAL PTE. LTD.
unique alternative design clothing for niche markets. many fabric print patterns are available for custom designs. the sunday lovely beach wear is the perfect piece for any fancy occasion. our main products are knitted & woven wears for ladies, such as dress,t-shirt, blouse top, skirt, pant, playsuits & jumpsuits, vest, coat, jeans, beach wear, sportswear. Package 1pc/polybag, per size or per color to bigger polybag,then into carton or as your request. Delivery time 7 Days for small orders after deposit and sample confirmed, or 2-3 weeks. We have sample room and experienced techical masters to ensure high quality and workmanship. we will charge a suitable sample fee, and it will be refundable when order is up to certain quantity. 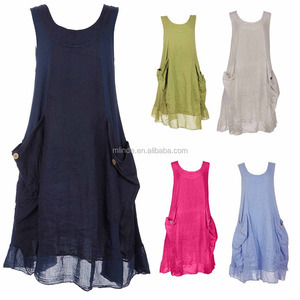 Alibaba.com offers 1,813 linen tunic products. About 22% of these are ladies' blouses & tops, 17% are plus size shirts & blouses, and 15% are casual dresses. A wide variety of linen tunic options are available to you, such as anti-static, anti-pilling, and anti-shrink. You can also choose from oem service, in-stock items. As well as from adults, children. And whether linen tunic is chiffon, knitted, or broadcloth. There are 1,717 linen tunic suppliers, mainly located in Asia. The top supplying countries are China (Mainland), India, and Pakistan, which supply 54%, 43%, and 1% of linen tunic respectively. 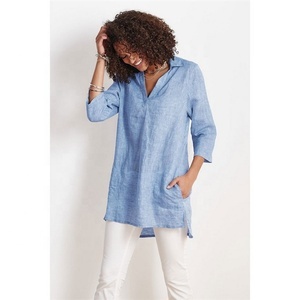 Linen tunic products are most popular in North America, South America, and Oceania. You can ensure product safety by selecting from certified suppliers, including 31 with Other, 4 with ISO9001, and 2 with BSCI certification.